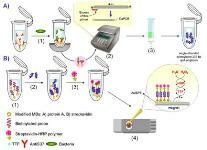 A magneto-electrochemical immunoassay approach coupled to direct asymmetric PCR (DaPCR) of the bacteria attached to capture antibody-Protein A-magnetic beads (MBs) is reported. DaPCR was used to amplify a characteristic 235-bp region of the gene coding for the major pneumococcal autolysin (lytA). The predominantly single-stranded and biotinylated amplicons were subsequently hybridized onto streptavidin-MBs modified with a specific biotinylated 20-mer capture probe. After binding a streptavidin-peroxidase polymer to the resultant biotinylated hybrid, the modified MBs were captured by a magnet on the surface of a TTF-modified gold screen-printed electrode (Au/SPE). The amperometric response measured at –0.15 V after the addition of hydrogen peroxide was used to monitor the hybridization process. DaPCR amplicons could be obtained with only 20 cfu of Streptococcus pneumoniae (S. pneumoniae), whereas no amplicon was obtained in the presence of high concentrations (~1.0x108 cfu mL-1) of other streptococci. The developed methodology allows an easy differentiation between 100 cfu mL-1 S. pneumoniae cultures and the asymmetric PCR blank control. Calibration curves were constructed for R6 and Dawn serotypes, with limits of detection (LODs) of 132 and 130 cfu mL-1, respectively. These values are approximately 100-1000 times lower than those obtained with disposable electrochemical magnetoimmunosensors without PCR amplification.